I awake. Of course, I am not thinking of business. I open my eyes and just for a moment think I am still in my dream. All I see is a beautiful blue sky with fluffy clouds… oh yes, and the 3 contrails of airplanes criss-crossing each other from left to right. I then realise I am not in my dream but in my bed, awakening to the view directly above me through my Velux window. The air is clear and quiet. So much so that I could hear the rumble of one of the jet planes. 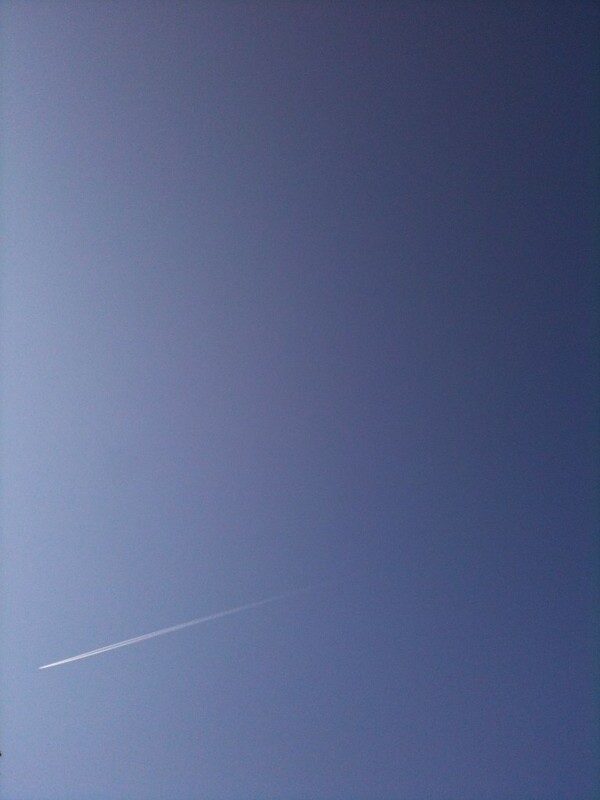 As I watched them, one contrail was much thicker, and one was thin and purposeful. The thicker one remained in the sky, while the thinner, more purposeful contrail moved quickly and disappeared quite quickly. This is simply a difference in air moisture and altitude. As I lay there, waking up proper, it occurred to me that business people are similar the way they go through their business day. Some will speed in, make a lot of noise, some will “arrive” and leave a lingering impression well after they have gone. So you could wonder which has the longer lasting impression? And which type of business person are you? It all has to do with attitude (not altitude). If you are self confident and your self esteem is intact, little will hinder you, little will hold you back, and little will knock you down. All the negativity you experience throughout the course of your day, will roll off your back like water. Why? Because you have a thick skin, are well heeled, and trust in yourself, your abilities, your successes and your business. And the other type? Well it’s hardly worth writing about because every person has the right to be successful, forward moving and confident in their abilities. But it is up to us as individuals to decide whether that is so. We can go with the consensus that the recession (or downturn, or economic collapse) has hit hard and of course there is no work out there, no contracts to obtain. Simply ask yourself then, are you doing business the exact same way as before, when things were good, the economy steady (in theory) and there was plenty of money around? If your answer is yes, then how can that way of business work now? When it’s hot, we turn on the air conditioning, when it is cold, we turn on the heating. We need to adapt, change course, get creative but most of all, decide to believe that there is work out there to be had and contracts to be won. Or has the world stopped completely? Great analogy. As I don’t run my own business perhaps it’s difficult to comment on this. However my boss and I, like to think that what we’ve achieved in the last 3 years has been akin to creating our own mini-business within the corporation. We’ve had to work hard establishing a brand and convince people to engage with us. In the current economic climate people will tend to focus on what they perceive as essentials in order to safeguard their positions. This means we have to work doubly hard to get the word out, and get internal customers. We’ve found Social Media inside the firewall a great way to make contacts, but this needs to be built upon with phone calls and face to face meetings to ensure we get business out of these relationships. Every part of a business can be run like a mini business. Even those working in corporations, work within their own department, whilst collaborating with other departments or factions of the organisation. So I think you are correct, and fair play to you and your boss, for taking the initiative, and putting in the man hours to build a strategy, that is obviously working! Elaine, I have nothing to say except this is a great great post. I loved it! 🙂 thank you Niall, enough said ! One thing I’d add is to be selective with your circle of friends, at least in the business world, as when things get difficult it really helps if they can offer you new ideas to make changes rather than keeping you where you are. A very good point. I feel that is why continuous and regular networking is so important, so that relationships can build organically and properly, and not a quick “I’ll scratch your back, while you scratch mine”. My professional experience has been that the more I meet with like minded business owners, they essentially become my advocate, and ultimately, a person I can trust.